Police agencies across the country have put their officers in harm’s way by using lead-polluted shooting ranges and by not educating them about safe practices. Amy Crawford was one of five Kirkland officers overexposed to lead in 2007 while training at the Issaquah police range, where the ventilation wasn’t working. “You literally couldn’t see one arm’s length in front of you,” she said. 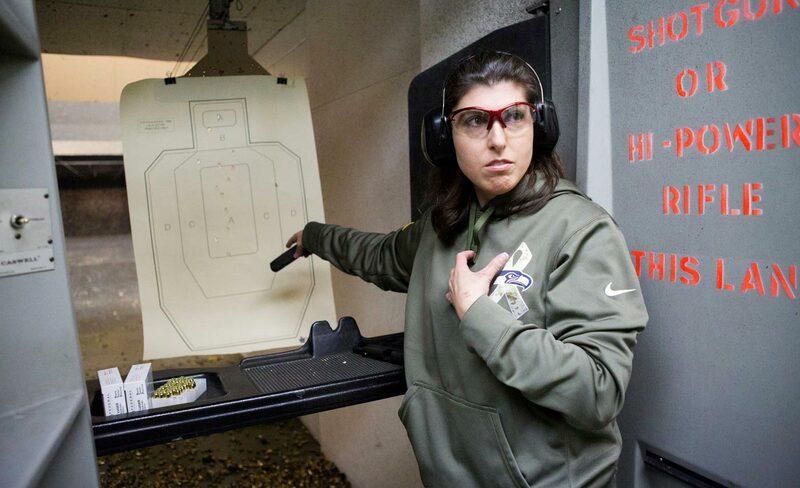 Here she shoots at an Everett range. It was one of the most important weeks in Amy Crawford’s law-enforcement career. Like tens of thousands of other police officers, Crawford had to become an expert at shooting a gun. Her job as a Kirkland corrections officer — and even her life — depended on it. On her fifth day of training at Issaquah’s indoor police shooting range, she passed the firearms tests. But she felt sick and had no idea why. Like so many other officers across the country, Crawford had gotten lead poisoning from shooting in an unsafe gun range. The Seattle Times’ ongoing investigation “Loaded with Lead” has found that city, county and federal police agencies across the country have put their officers in harm’s way by failing to clean their indoor ranges, replace dilapidated ventilation and educate their employees about the risks of lead. In hazy, dirty gun ranges, officers fired lead-based ammunition, unknowingly spreading lead vapor and dust, which they then inhaled, ingested or absorbed through skin contact. In Largo, Fla., a range master at the police shooting range says lead exposure caused his teeth to fall out and he now suffers from neuropathy. In Londonderry, N.H., a 35-year-old police sergeant died of lead poisoning just days after training his fellow officers at a private indoor-gun range. Cases like these have spanned decades, despite a litany of reports and warnings about the dangers of lead in police gun ranges. In the Seattle area, Issaquah, Kirkland and Bellevue police departments have violated workplace-safety laws about lead, all saying they were unaware of some of the rules. Even so, the state had warned Issaquah about lead problems in the past. As of this month, the city still hasn’t fixed the ventilation. Lead contamination at police-operated ranges has gone unchecked for years because federal and state regulators rarely scrutinize them, The Times has found. Inspectors usually only show up after someone files a complaint, or after it’s too late — when a blood test shows an employee already has lead poisoning. For more than a half-century, studies showed officers were overexposed and even poisoned by lead contamination at law-enforcement gun ranges. Despite these cases and overwhelming evidence of the dangers of lead, police departments have continued to put officers in harm’s way. Two Kansas City police officers suffered severe lead poisoning after working several months at the indoor-gun range in the basement of City Hall. Both retired on disability because of the lead. National Institute for Occupational Safety and Health studied nine law-enforcement indoor-firing ranges and determined all had inadequate ventilation and several had heavy lead contamination on surfaces because of poor cleaning habits. During three months of firearms instruction at an indoor-firing range, the blood lead levels of 17 trainees rose from a mean of 6.5 micrograms per deciliter before training to 50.4 post training. Organ damage can occur at 10 micrograms. Several employees at the Newton Police Department had elevated levels of lead in their blood because the shooting range was poorly ventilated and not cleaned. Wilton Police Department closed its basement indoor-shooting range after an inspection determined it violated four lead standards. Lead contamination spread to a nearby office and an emergency-operations command area. Just last year, a concerned police-firearms instructor complained to Maryland state safety officials about lead hazards at Baltimore County’s gun range — where more than 1,900 county officers train and requalify — to prove their proficiency with a service firearm. In February 2014, after officials with Maryland Occupational Safety and Health (MOSH) inspected the gun range, they found 27 violations, 16 related to lead. It was the first safety inspection of Baltimore County’s nearly half-century-old facility, they said. Baltimore County police set a record — the most lead violations for a law-enforcement agency in the past decade, according to a Times analysis of available federal Occupational Safety and Health Administration records. Maryland inspectors found problems with poor ventilation and inadequate cleaning at the Lutherville range. And in talking to several Baltimore County firearms instructors, inspectors learned that the lead problems were getting worse. The instructors revealed they had been tested a few times for lead levels in their blood, and the most recent results were getting higher, records show. One instructor had an elevated lead level of at least 25 micrograms per deciliter, a MOSH supervisor said. Organ damage and other health problems can occur at a level as low as 10 micrograms, according to the Centers for Disease Control and Prevention. Lead exposure is particularly dangerous because damage can occur even though symptoms may not appear. While instructors and SWAT teams spend the most time in a range, other officers are required to qualify up to four times annually and to practice as needed. Baltimore County’s most dangerous problem was the toxic air that instructors inhaled while working in the range. They were exposed to air that had lead concentrations up to three times higher than the allowable limit, MOSH documents show. The ventilation and air quality were so awful that the instructors, by law, should have been wearing respirators, protective coveralls and bootees while training. Police administrators had no idea of the problems until the state inspection, said spokeswoman Elise Armacost. More than a year after the inspection, the range still isn’t in compliance. Armacost said the county will spend $500,000 to replace the ventilation system and abate the lead contamination by the end of the summer. Currently, police are advised to use the outdoor range but still are allowed to shoot for short periods of time in the indoor range, Armacost said. Last year, seven years after Kirkland officers were overexposed to lead, the state found contamination at the Issaquah police range where they had trained in 2007. Issaquah, Kirkland and Bellevue police departments have violated workplace safety laws about lead, all saying they were unaware of some of the rules. The state had warned Issaquah about lead problems in the past. The city still hasn’t fixed the ventilation. Two of the most important ways to prevent lead poisoning is to educate shooting instructors and trainees about lead hazards and to properly ventilate the range. In the case of three Kirkland correctional officers, they got neither. In 2007 the Kirkland police’s Corrections Department decided its officers needed to carry firearms. Without a shooting range, Kirkland used the Issaquah police indoor-firing range that March to train and qualify the officers. Two Kirkland firearms instructors conducted a five-day training and qualification course for Crawford and two other corrections officers. After a day in the classroom, they spent the next four days firing .45-caliber handguns in the range. Crawford, who had been a corrections officer for two years, said there was little discussion about the risks of lead exposure and how to avoid it. On the final day, as they started qualifications testing — timed and untimed drills of shooting at targets from different distances — the range became cloudy. Kirkland Police Sgt. Nathan Rich, a SWAT member and one of the firearms instructors, had tried to turn on the ventilation, which would move the lead-contaminated air away from shooters. But it didn’t operate. Despite no air flow and a noticeable haze in the range, Rich ordered Crawford and her colleagues to continue firing because he said he wanted to avoid rescheduling the qualifications. They all coughed but continued firing up to 1,000 rounds over five hours, not realizing they were inhaling dangerous amounts of lead. “You literally couldn’t see one arm’s length in front of you,” she said. Crawford went home feeling nauseated and weak, with a headache and a sweet metallic taste in her mouth. The two other corrections officers complained of similar flu-like symptoms — classic signs of lead exposure. After one complained to Kirkland police, they were sent to have their blood tested for lead. The two instructors and three corrections officers all had elevated levels of lead in their blood, according to records from Washington Labor and Industries (L&I), which enforces workplace-safety rules. Their results ranged from 25 to 33 micrograms of lead per deciliter — more than 20 times the average adult level of 1.2. In as little as a few days, officers in a poorly ventilated range can develop lead levels that can cause fatigue and miscarriages as well as permanent damage to the brain and kidneys. Crawford recalled having the highest reading, 33. Rich said he received little training about the dangers of lead when he became a firearms instructor in 2001. “I felt bad for the officers that I got them sick,” he said. He is concerned his decision to keep shooting that day may later have repercussions on their health. One reason he moved to the patrol division was to reduce the amount of time he was exposed to lead in the range. “As we get older, we may have some neurological-function issues, some organ issues that you can’t predict and see right away,” Rich said. The police shooting range where the Kirkland officers were overexposed is tucked under Issaquah’s redbrick City Hall. Because of the Kirkland case, L&I inspected the Issaquah range in 2007 and issued two lead-related citations. Then in 2008 and 2009, Issaquah requested help from L&I through “consultations.” The state uses this voluntary process as an informal, private way to get employers into compliance with state safety regulations. After one of the consultations, L&I told Issaquah police they must conduct lead training and minimize surface contamination. But in April 2014, an L&I inspection showed contamination on classroom tables, the floor and a carpeted area outside the range, which had lead concentrations 22 times higher than what’s acceptable. Air flow in some of the firing lanes was too turbulent, swirling dirty air back on shooters. Nine law-enforcement agencies, as well as the public and members of two private firearms academies, shot in the range, unaware of the hazardous conditions. “Sgt. (Paul) Fairbanks stated that the officer’s primary duty is to protect the citizens and that the range duties (i.e. cleaning) were additional tasks they tried to fit in their schedule,” an industrial hygienist wrote after talking to the part-time range master. When L&I confronted the department over the violations, some Issaquah police officials were uncooperative. In June, they refused to allow the hygienist to collect samples and take airflow readings and photos while police sorted the spent lead from the berm for recycling. When a hygienist wanted to interview several officers, Police Chief Scott Behrbaum refused. After L&I threatened to use subpoenas to compel private interviews with employees, the chief relented. L&I issued 15 citations, nine related to lead. The city of Issaquah appealed some of them as well as the $3,000 fine, saying it would rather use the money to fix the problems than pay the state. A hearing officer concluded all the violations had occurred, but lowered the total fine to $2,700. Issaquah corrected nearly all of the violations. It hasn’t fixed the ventilation, but Fairbanks said it doesn’t pose a significant health risk. Well before the government banned lead-based household paint in 1978, medical journals and state health publications dating to the early 1960s warned that police officers were suffering from lead poisoning due to working in gun ranges. But police departments often ignored those warnings and rarely passed them down to the rank and file. Two Kansas City, Kan., police officers suffered severe lead poisoning in 1973 after working several months in a new indoor-gun range in the basement of City Hall. A faulty ventilation system recirculated airborne lead. The city settled lawsuits brought by the two, paying $100,000 each to the officers. They said they had to retire on disability because of the lead exposure, according to The Kansas City Star. The National Institute for Occupational Safety and Health (NIOSH) studied nine indoor law-enforcement gun ranges and found many deficiencies, in particular “health hazards in the forms of lead poisoning due to improper ventilation control,” a 1975 report said. NIOSH also wrote a technical manual about reducing lead hazards for law-enforcement officials to follow. Despite the research and warnings, some departments didn’t take lead hazards seriously. In Florida, Edmund Danielewicz went to work in 1980 at the Largo Police Department’s indoor range, which had a history of employees getting lead poisoning from faulty ventilation. After a year there, he lost 45 pounds, his teeth and eventually most of the feeling in his legs, he said. The physician for the city told him he had lead poisoning and to drink orange juice and water to feel better, he recalled. By 1981 Danielewicz claimed the shooting range poisoned him. But the department denied it and fired him, he said. After a legal battle, he said he settled for $100,000. Pat Kelly shows her late husband’s police badge, uniform patch and driver’s license. They had a 21-month-old son and a daughter on the way. For Pat Kelly, that sunny Sunday morning was like any other at their Londonderry, N.H., home. She awoke to 21-month-old son David crawling into his parents’ bed and wanting to play with his father. But when he didn’t respond to the boy’s giggles, she leaned closer to her husband — and discovered his body was cold. Thomas Kelly, a 35-year-old police sergeant, was dead. His death on Sept. 17, 1989, stunned officers at the Derry Police Department, where he’d worked for more than nine years. Pat was devastated: She was six weeks pregnant, had a toddler, her mother was dying of cancer, and the love of her life had suddenly and mysteriously died. Derry Police Chief Ed Garone said as a sergeant and training supervisor, Kelly, was a natural leader, teacher and visionary. Garone approved Kelly’s request to train all the officers who had been using revolvers to shoot new semiautomatic handguns. “It was frankly a morale booster, increasing the safety of the officers and the greater protection for our citizens,” Garone said. Without an indoor police range, Kelly looked for nearby ranges where the 45 officers could train and qualify over that one week in September. He found Chester Rod and Gun Club, just 10 miles down the road. Kelly had assurances from the private club that the ventilation worked properly and the range was safe, Garone recalled. But Kelly had unknowingly stepped into a death chamber. Each day, he stood beside officers as they fired hundreds of rounds of ammunition at the targets. But the ventilation system failed to keep up, and smoke laced with lead lingered in the air, officers said. “It got so thick that you got to the point where you just could not see,” said Barry Charewicz, a Derry officer at the time. Dan Pelletier, then a Derry detective and firearms instructor, said, “I had that metallic, leady taste in the back of my mouth, and at the end of the day I’d have a pretty good headache too.” A blood test showed he had an elevated lead level. Unlike other officers who would train and leave, Kelly was in the range almost the entire time as police fired 24,300 rounds of ammunition that week. During breaks and each night, Kelly swept the floor with a dry broom, picked up spent casings and put them in buckets. Sometimes he wore a paper mask to avoid breathing the dust in the air, but he was unaware it contained potentially lethal amounts of lead, Pelletier said. The day after certifying all the officers, Kelly came home after a long shift and told Pat: “I’m beat, I’m going to bed. Goodnight.” Those were his last words. About a month after Kelly’s death, an autopsy revealed he had died from acute respiratory failure and severe pulmonary edema due to prolonged exposure to toxic heavy metals and gases at a firing range. Tests showed he had dangerously high concentrations of lead in his blood at 48 micrograms per deciliter. Laura Kelly, left, never met her father; her mother, Pat, was six weeks pregnant when Sgt. Thomas Kelly died in his sleep in 1989 in New Hampshire. “I want people to take it seriously that you can have a loved one die from this,” Pat Kelly said. Pat still misses the smell of leather and the feel of the bulletproof vest under her husband’s stiffly pressed uniform when she hugged him. She occasionally shows his uniform, badge (No. 3) and gun belt to their 24-year-old daughter, Laura, when she’s curious about the father she never met. Pat sued the Chester Rod and Gun Club and settled for an undisclosed amount years ago. Everyone realizes his death was preventable. “If I were to do it again, I would have daily air monitoring done and certified by a third party,” Garone said. His officers now shoot at their outdoor range. Charewicz blames the club for Kelly’s death. The nearby Sandown Police Department has been shooting there since 2011. Kevin Williams, president of the club, didn’t return calls for comment. Today at the Derry Police Department, a training room is named in Kelly’s honor and a painting of him, smiling in uniform, hangs on a wall. But outside of New Hampshire, few have ever heard of Kelly’s death and its cause. “I want people to take it seriously that you can have a loved one die from this,” Pat Kelly said. In Derry, N.H., Police Chief Ed Garone shows the framed uniform of Sgt. Thomas Kelly, who died in 1989 after a week of exposure to lead. Training officers on new handguns, Kelly was in the shooting range almost the entire time 24,300 rounds were fired. Two decades after Kelly’s death, inspections and evaluations show police across the country are still ignorant of workplace-safety laws and lack fundamental training. Currently, there are more than 1.1 million federal, state and local law-enforcement workers in the U.S., according the Bureau of Justice Statistics. In Bellevue, the Police Department shut down its range for two years because of its inadequate ventilation system. A year after it reopened with a new system in 2012, L&I found contaminated surfaces and inadequate training during an inspection. It issued nine citations, six related to lead. In South Central Washington, the Kennewick Police Department doesn’t educate its officers at all about lead hazards. But Washington Administrative Code says, “Each employer who has a workplace in which there is a potential exposure to airborne lead at any level shall inform employees” and train them about lead. This includes all indoor and outdoor ranges. While the risk of lead exposure is greatly reduced when officers shoot outdoors, it’s not eliminated. Officers can track lead home on their clothing and shoes, contaminating their homes and putting their children at risk. After evaluating the Lima, Ohio, Police Department’s indoor-gun range in 2012, NIOSH told the police chief to shut it down until a faulty ventilation system was fixed. It had pumped lead vapor and dust into its garage and a maintenance office where an employee breathed in contaminated air and suffered lead poisoning. NIOSH evaluates work conditions at the request of a concerned employee or employer, but cannot force a company or government agency to abide by its recommendations. Lima Police Chief Kevin Martin didn’t follow NIOSH’s advice. He bought a new vacuum cleaner and better filters, he said. Christine Willmsen: cwillmsen@seattletimes.com or 206-464-3261. On Twitter @christinesea. Lewis Kamb and Justin Mayo contributed to this report. Police Sgt. Daniel Willson, Kirkland’s senior firearms instructor, sweeps up spent casings at the department’s lead-free firing range in the Totem Lake area. This month, Kirkland police opened what it believes is the first lead-free indoor-shooting range in Washington state, an eight-lane facility costing $1.3 million. One reason for the expenditure: Five of its officers were overexposed to lead while training at the Issaquah police range in 2007. Kirkland Sgt. Daniel Willson, senior firearms instructor, said police feel safer in the new range. “It’s better, easier cleanup and it’s healthier,” he said. They’re no longer concerned about lead on their hands and face and the need to change clothes to prevent tracking the toxin into their homes where family could be overexposed. Willson said police departments reluctant to go lead-free because the ammunition is costlier should take the long view. Lead-free ammunition, primarily made of copper, costs the Kirkland Police Department about $375 for 1,000 pistol rounds, $100 more than the lead version. For rifles, it pays $595 per 1,000, $295 more. Concerns that lead-free bullets are less accurate just aren’t warranted, Willson said. “It’s so minimal in the handguns that we’re shooting,” he said. “…You’re not going to notice a difference.” Police still rely on lead bullets when on regular duty. Amy Crawford, a former Kirkland corrections officer poisoned at the Issaquah range, said ranges should be inspected annually by workplace-safety agencies. Police chiefs in North Dakota, Connecticut, New York and other states have shuttered their ranges in recent years as the last resort, after realizing their old ranges are too contaminated and dilapidated for use. Just months into the job, he closed the range. The city paid $100,000 to clean the basement, haul out contaminated equipment and remove 18,000 pounds of lead. Christine Willmsen: cwillmsen@seattletimes.com or 206-464-3261. On Twitter @christinesea.